I’ve received about a dozen emails asking me to make a Candy making app in addition to the Todo Candy app already present in the iTunes and Google Play Stores. At first I thought wow, this could be difficult but at the same time it could be very fun and rewarding for everyone. So lately I have began researching in the app stores for a few ideas however, I have also found similar websites that give me very good ideas. I know most of you drool over all candy and especially my Candy Tuesday videos (kidding)! I was recently guided by google in my quest to find different types of cooking games into a Candy game. 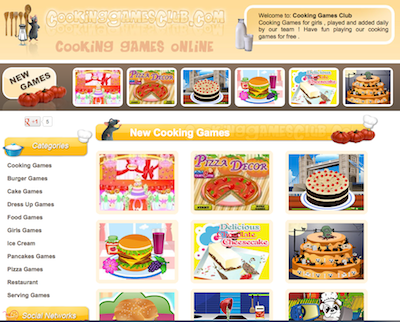 The website Cooking Games Club popped up. They have loads of categories for me to get ideas: cooking, burger, cake, dress up, food, ice cream, pancakes, pizza. I know they all sound very yummy. Although all of these games are based in Flash there is a lot that can learned for the upcoming Candy Making App! Be sure to check out more post because you guys who have emailed me, have definitely motivated me to create something very fun like this!